Look out for English football coming together to raise awareness of cancer this Easter. The Know The Score campaign, which is backed by leading health charities including the MHF, will also be launching a new silver Bowel Cancer Star of Hope badge for Bowel Cancer Awareness Month. The campaign features former England players Martin Peters MBE and Les Ferdinand MBE together with current players Faye White MBE of Arsenal and James Milner of Manchester City. 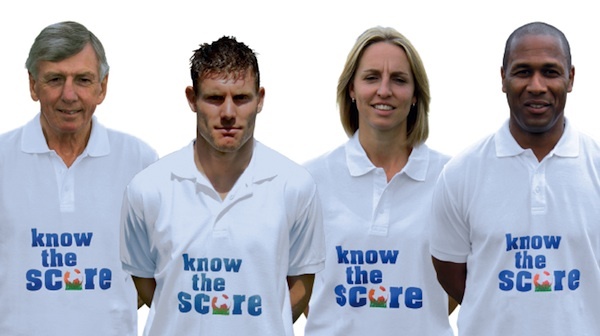 You can see teams and match officials wearing Know the Score t-shirts for the televised games Swansea v Newcastle (Good Friday) and West Ham United v Birmingham (Easter Monday). All told at least 15 football league teams will be wearing the t-shirts. Also check out your team's match day programmes over the Easter period. More on Know The Score.